It’s expensive and time-consuming for manufacturers to ensure the large objects they make, such as aircraft wings and earth-moving equipment, are the right size for proper assembly and function. 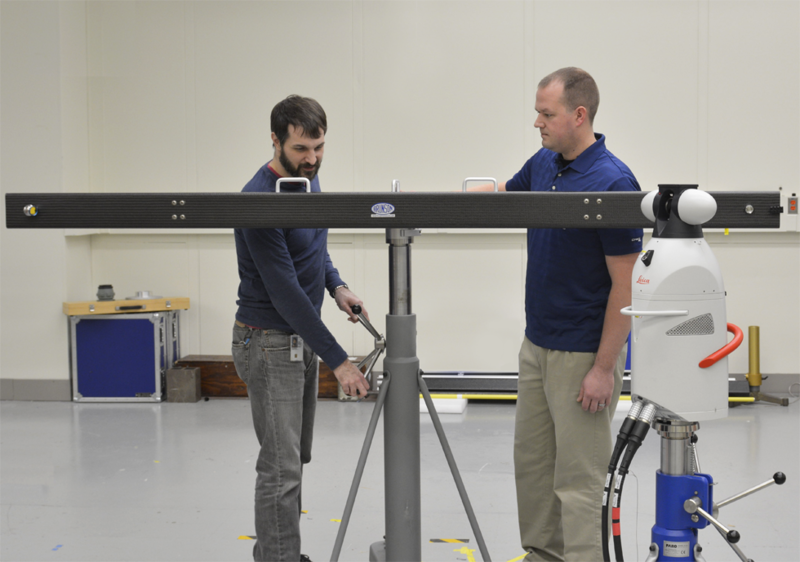 Industry turned to NIST researchers for help in engineering a device that can quickly and accurately test the measuring systems manufacturers use on the factory floor. Setting up the length artifact on its custom tripod. When Brunson Incorporated, a U.S. manufacturer of metrology equipment, wanted to develop a device that could test the performance of laser tracker measuring systems in the field, it turned to NIST for help. The testing device they sought to develop needed to be easy to transport and use with appropriate levels of accuracy so that laser trackers, which are portable systems, could be tested for common errors each time they were moved. When paired with a test protocol developed by NIST in 2014, the device designed through a collaboration between Brunson and NIST under a Cooperative Research and Development Agreement could be used to quickly and accurately test whether a laser tracker is working properly, potentially saving manufacturers significant time and money. The main technical challenge in developing this device was making sure it maintained its calibrated length, since structures of this size can easily warp or bend in unexpected ways during shipping and use. Brunson looked to NIST engineers’ and their years of experience developing similar equipment for their research in the laboratory for help. The partnership with Brunson combined the company’s funding, product design and manufacturing with NIST’s precision measurement expertise. Now, Brunson is selling the device to manufacturers who can use it to check their laser trackers on-site. Laser trackers can measure the dimensions of objects as long as a football field with uncertainties as short as half the width of a human hair. NIST engineers invented the first laser tracker in 1987, and since then, have continued research in measurement applications, standardization, uncertainties and testing. This commercialized product, which uses NIST’s test protocol, is the latest of many significant achievements that have ensured the quality of measurements made with laser trackers.